Independent Directions to this Site: From Highway 417 (The Queensway) take exit 138 (Eagleson/March Roads). If travelling west, the 0.6 km offramp sends you right or north onto March Road. If driving east, a 0.4 km offramp brings you to Eagleson Road, where you will turn left or north onto it and in 0.5 km join the westbound offramp traffic on March Road (it changed names as you went under the overpass). Both groups will now follow March Road northwest 8.0 km to Dunrobin Road. Turn right or north onto Dunrobin and go northwest 20.2 km to the Galetta Side Road. Continue straight across this junction northwest into the MacLaren's Landing area. Ottawa River West: Ontario Route Directions: Exit the Constance Bay area via the southwestern end of Constance Bay Road at Dunrobin Road. 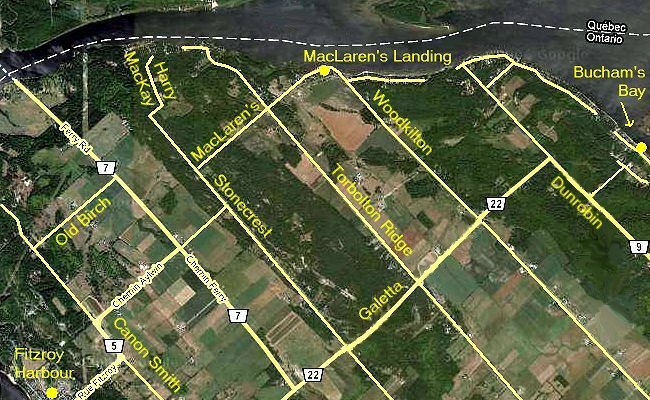 Turn right or northwest onto Dunrobin and go 4.7 km to the Galetta Side Road. Continue straight across this junction northwest into the MacLaren's Landing area. You can also cut your tour along the Ottawa River West - Ontario route short here and take the Woodridge - Quyon ferry to Quyon and explore the Ottawa River West - Quebec route. You could use this ferry to perform a loop back to the metropolis. The ferry only runs when the river is not frozen. Site Description and Birding Information: On route to the MacLaren's Landing area, Buckham's Bay cottage area should be checked in winter for it's active feeding stations. Enter 2.8 km northwest of Constance Bay Road on Dunrobin Road. The northwestern extention of Dunrobin Road to Crown Point goes through some mature coniferous forest. Scan the shore at MacLaren's Landing, where you will have excellent views of the river. Check the feeders here in winter. Then go southwest on MacLaren's Side Road. The mixed forest in this area is excellent for both breeding birds and wintering birds. Good habitat is too widely available to concentrate migrants, but migrants there are. MacLaren's Side Road and Stonecrest Road was the site of breeding Olive-sided Flycatchers for years. Sedge Wrens were found breeding on the old farm on Harry MacKay Road, the northwestern extention of Stonecrest. Black-backed Woodpeckers were found here too. Ottawa River West: Ontario Route Directions: Exit the MacLaren's Landing area from the junction of MacLaren's Side Road and Stonecrest Road. Proceed southeast 0.6 km on Stonecrest Road to Aylwin Road, then turn right or southwest onto Aylwin and go 2.2 km to the Canon Smith Road. Turn right or northwest onto it and proceed 2.0 km to the entrance of the next site, Fitzroy Provincial Park, on the left.